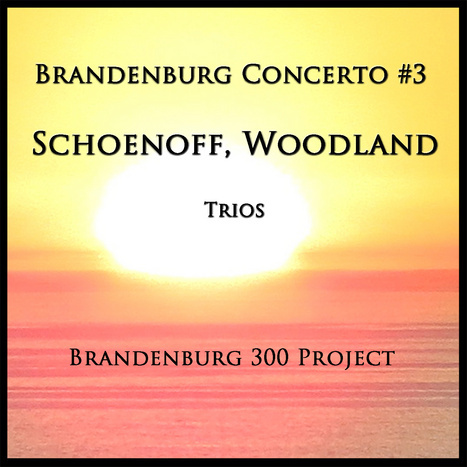 A deconstruction of the 3rd Movement of the 3rd Brandenburg Concerto into two (single note) piano trios. I like to think of the 3rd Concerto to be the one where he and the true love of his life Ana Magdalena find each other and know they are meant for each other. Both longed for a future filled with music. The wanted the joys and challenges of a large family. I can only imagine the 35 year old, emotionally raw Bach seeing the 20 year old Ana Magdalena waiting to audition for Bach’s choir. Did he fall in love with her the instant he saw her, or did the sound of her voice cause him to see her and love her as only his ears could have directed? Did he know instantly that life would be better? Or did their first meeting give maybe just a sense that happiness was on the other side of his despair? The honorees in the 3rd Movement are men who helped me through critical phases of my life. They are John Schoenoff, my John Burroughs Junior High School Guidance Counselor; and Woody Woodland, who himself headed a large, wonderful family, and is also responsible for some of the most important strategies used by Sunlaw to accomplish its highest objectives.